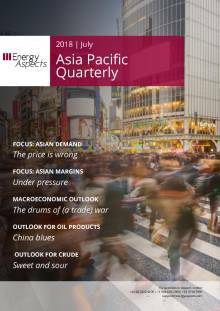 This is the 12th edition of our Asia Pacific Quarterly, which provides detailed analysis of Asian crude and product markets. It covers the economic and political trends shaping demand and supply patterns in the region and draws on our wealth of expertise in global oil and products markets as well as the region itself, from Northeast Asia to South Asia. Each quarter, Focus pieces delve into key issues that will impact the market in the short and medium term. In Focus – China in 2019: Markets are fretting about the slowing Chinese economy. While trade negotiations with the US are unlikely to collapse, a full resolution is also improbable. But this will still allow Beijing to refrain from widespread credit stimulus, suggesting that China’s growth will slow even further before support measures kick in to stabilise the economy, likely in H2 19. Chinese crude buying will be volatile, however, due to the ramp-up profiles of the new refineries, the teapots’ policy-driven buying sprees and the majors’ uncertainty about product export quotas. But Chinese refinery runs, which are set to rise y/y by around 0.50–0.55 mb/d, will exceed end-user demand growth of around 0.30–0.35 mb/d. In order to balance this excess, the government will need to open the export floodgates, or refiners will be forced to cut runs. In Focus – Asian margins: After enjoying several years of stellar margins, refiners will grapple with global capacity additions outpacing oil demand growth in 2019. But many believe this pain will be short-lived, given that IMO 2020 is around the corner, bringing with it higher diesel demand. Perversely, this may make margins worse in 2019—at least in the summer, as it encourages a business-as-usual mentality. But maintenance at high-profile export-oriented refiners including India’s Reliance, Singapore’s Shell Bukom and Exxon Jurong, Taiwan’s Formosa and Vietnam’s Nghi Son will help tighten product markets and support margins this spring. Macroeconomic outlook: China’s economic deceleration is already affecting many other regional economies, especially export-oriented economies such as Korea, Malaysia and Indonesia . At the same time, the prospect of a stable, or even weakening, US dollar may offset some of the downward pressure from the US-China trade war, while countries such as Thailand, Vietnam and Malaysia, could stand to benefit from trade and investment being diverted away from China. Outlook for oil products: The outlook for Indian demand is increasingly uncertain, as the falling popularity of the Modi government may result in a coalition government following the elections this spring. This could mean policy paralysis and slowing demand growth in H2 19, following strong growth before the elections in Q2 19 amid hefty refinery works as Indian refiners prepare for BS VI in the north in April. Outlook for crude: The tightness in sour markets in the west has yet to catch on in the east, as key sour-crude processing refineries are going off for maintenance. But by Q2 19, eastern sours are set to outperform as new sour crude refiners ramp up and US waivers on Iranian exports could be cut by up to half. With at least 0.6 mb/d of Saudi sours committed to new refineries, even if Saudi Arabia were to reverse its cuts, it would not be able supply all the current buyers of Iranian oil. The Asia Pacific Quarterly also provides a unique, comprehensive overview of developments in the downstream sector and their implications for crude and product trade flows, SPR builds, refinery runs and yields, as well as an outlook for the region’s crude oil production. This is the 11th edition of our Asia Pacific Quarterly, which provides detailed analysis of Asian.. This is the 10th edition of our Asia Pacific Quarterly, which provides detailed analysis of Asian.. This is the ninth edition of our Asia Pacific Quarterly, which provides detailed analysis of Asia.. This is the eighth edition of our Asia Pacific Quarterly, which provides detailed analysis of Asi..